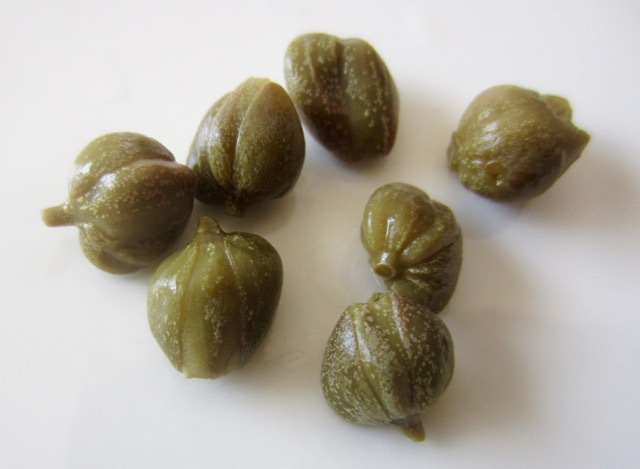 Caper is a small, dark green flower bud (unopened flower) of the Caper bush (Capparis spinosa), used as a pungent condiment in sauces, relishes, salads, and various other dishes. The flower bud is usually pickled in salted vinegar or packed in dry salt (dry salted). Most of the jars you see at the grocery store are pickled capers. 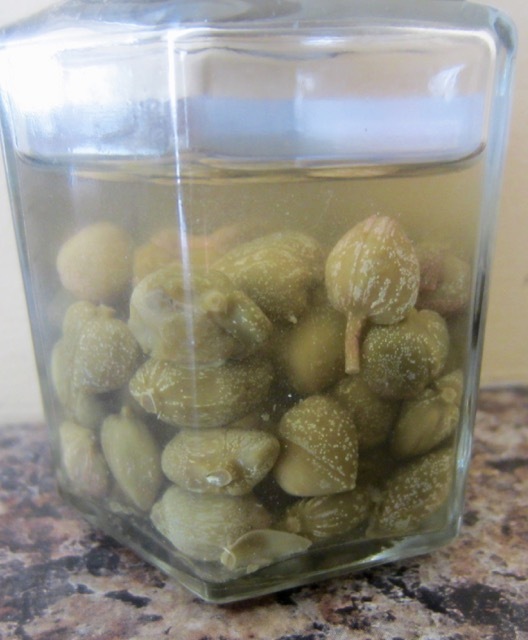 The basic ingredients in pickled capers are: capers, water, vinegar and salt. Fresh caper buds are very bitter but once pickled they develop a distinctive acidic and salty metallic flavour and a goat-like aroma. The acidic flavour comes from Capric acid, which develops during pickling. The word Caper in Greek means “he-goat” Caper flavour is usually described as goaty. Caper bush is native to the Mediterranean region and is common in North Africa, Spain, Italy and Algeria. The fruits, called caper berries and leaves are also used. The smallest caper buds are about 3mm, are the most delicate and are called non-pareils. The larger ones are called capucines and are about 10mm in size. The larger flower buds are considered, low quality. Grading: non-pareil, surfines, fine, mi-fine and capucines (about 1cm). Capers are commonly used in Mediterranean and Italian cuisines. Pickled capers can be used without rinsing (unless you are on a salt-free diet). 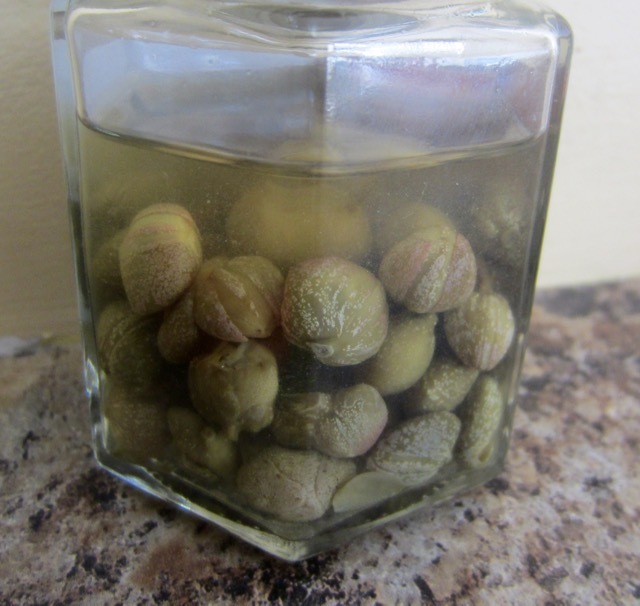 Dry salted capers should be rinsed thoroughly and lightly dried on paper towels, before being used. 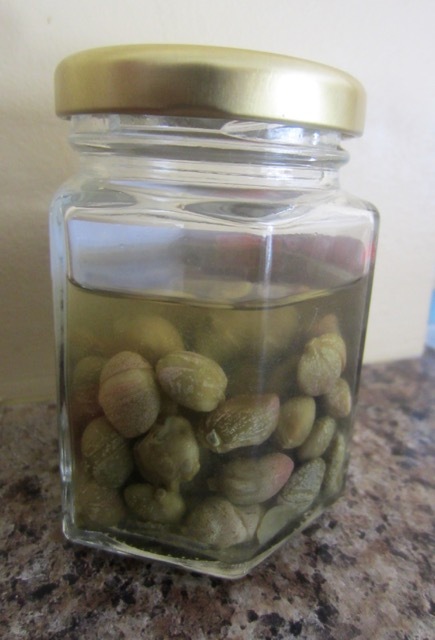 Capers should be used sparingly (1-2 teaspoons per 500g meat veggies, pulses or grains). In Italian cuisine, they are used in salads, pasta salads, meat dishes, and pasta sauces. They are used in chicken piccata and spaghetti alla puttanesca. They are used in strongly flavoured oily fish and to enhance flavour in salads alongside olives. They are a key ingredient in tartar sauce and Montpellier butter. 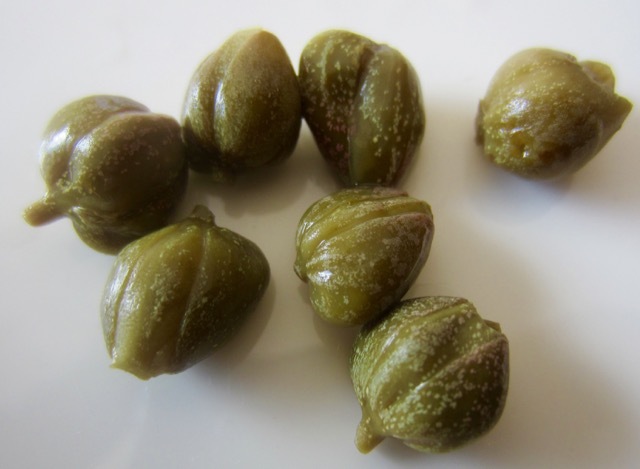 Capers are also used to flavour Hungarian cheese, Liptauer. Caper berries (fruits) are also pickled especially in Cyprus where they grow in abundance. Caper berries are an ingredient of tapas menus in Spain. Store pickled capers in the fridge after opening and make sure they are immersed in the pickle liquid. 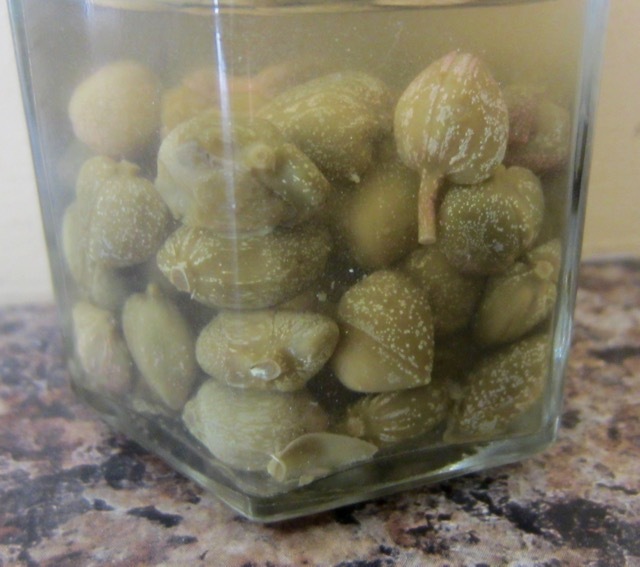 Dry salted capers don’t need refrigeration after opening. Store in an airtight container. The flavour deteriorates when they come in contact with air. A spiny Mediterranean shrub up to 1.5m tall (Capparis spinosa) having white to pale lilac flowers and dehiscent fruits with reddish pulp. I like capers with a fennel salad. I have just had a salad with capers…It was good.